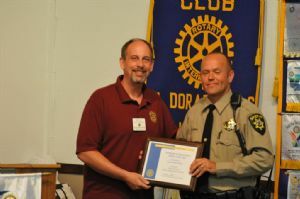 Rotary President Bill Tobin presented the club's Peace Officer of the Year award to Deputy Steve Klang at the Oct. 20 meeting. Deputy Klang has been with the El Dorado County Sheriff's Office since 1997 and served as school resource officer for the last four years. Deputy Klang works at three comprehensive high schools, two continuation schools, charters schools and sometimes middle schools. He has dealt with 292 incidents of all types.